Premier Houseboats are pleased to present an extremely rare opportunity to purchase a freehold mooring on the Thames at Kew Bridge. The mooring is 135′ long, part of a 220′ mooring which is being sold off by the current owner. There is a possibility that the other part of the mooring may become available in the future.The mooring has mains electricity, gas and water available. There are two secure and roofed parking spaces that come with the mooring, these again are very difficult to obtain and therefore a considerable asset. Currently there are five boats on the mooring, extending 50′ from the river bank, that are producing in excess of £6000 per month income. The opportunity here is an obvious one, a mooring that can be used for your own boat, saving a considerable sum of money on your own mooring fees over time, plus the opportunity to rent out moorings and create an income, and therefore a return on your investment. 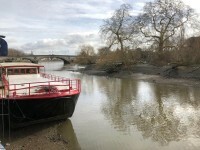 The residential mooring is in a stunning location just along from Kew Bridge, with excellent transport links into central London. The footpath alongside the moorings is well lit and properly paved. This is an extremely expensive area, and this offers an affordable opportunity to live on a large houseboat in a sought after area. The mooring is fully registered with the land registry, details are available through the owner when required. This is a rare opportunity with many advantages, and has very recently dropped in price by £200,000 to facilitate a quick sale.